The second annual Chronicles of Narnia Reading Challenge is coming right up! Are you ready for it? The rules for the challenge are simple and easy - read as much or as little in or about Narnia as you can during the month of July. The challenge starts on July 1st when I will invite you to write up a post on your own blog saying that you are joining in on the challenge. If you do not have a blog, feel free to join in simply by leaving a comment so that we know you are playing along. Then you have the entire month of July to read whatever you can that relates to Narnia (or watch the movies!) and write up posts on your thoughts and experiences in doing so. The challenge will end on Friday, July 29th. How well do you know Narnia? Have you ever been before? Here are some questions, gleaned from So You Think You Know Narnia? 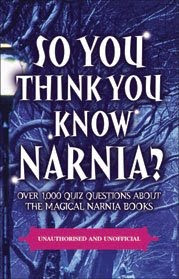 : Over 1,000 Quiz Questions About the Magical Narnia Books for you to try and answer going in. Ready to put on your Narnia thinking cap? We'll start easy and move on to some potentially more difficult questions for you. I have two copies of Knowing Aslan to give away to two of you who make a go of answering these questions. Just leave your answers (or your guesses!) below and I'll select a winner via random.org and will announce the winners at the Chronicles of Narnia Reading Challenge Start-up. (July 1st!) That's a week from today! Get ready to dive on in! 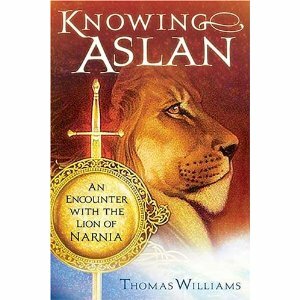 Without further ado, here we go with 10 Narnia-related questions. Who wrote the Narnia books? Was Trumpkin a dwarf, a faun or a mouse? At the beginning of The Magician's Nephew, who climbs over the wall into Polly's back garden? According to Puddleglum in The Silver Chair, are giants good shots at throwing things? In The Horse and His Boy, what is the first talking animal Shasta meets in Narnia: an owl, a badger or a hedgehog? In which book is there a Sunless Sea deep underground and a prince under a spell? What item did Mr. Beaver show the children to prove that he knew Mr. Tumnus? What was the strange name of Jill and Eustace's school, mentioned in The Silver Chair? Who received a new sewing machine from Father Christmas? Eustace learn to shoot a bow and arrow while voyaging on what boat? Answers revealed next Friday, July 1st along with the names of the winners! Have fun! Oh my! I would have to research to answer almost all of them since I've only read most of the books once! I will see if my husband knows more than me, and if so, I will return with an actual entry. Great teaser for the upcoming challenge!!! Wow, more reasons why I must finish the series. I only know a few of these. :) I can't wait till next week! ?? Obviously one I haven't read. I'm excited about the challenge. I really enjoyed reading all seven of the books during last year's challenge, and I'm contemplating doing the same this year. 4. No, they are not. 8. No idea . . .
A quiz - how fun! I only had to look up 2 answers (at least I knew where to find them). I'm not sure what I'll read yet. Once again, I'm reading a BIG book (the unabridged Count of Monte Cristo), but I'll try to fit something in. Yay! I'm so excited to be joining in with the challenge again this year. I've written my intent post--and now to answer some trivia! Ooo-tough one. I can't think of it. I'd like to participate in the challenge, despite my total reading slump these days. Right now I'm drawing a blank on any Narnia-related titles though... Maybe I'll get some ideas from reading your and others' posts.